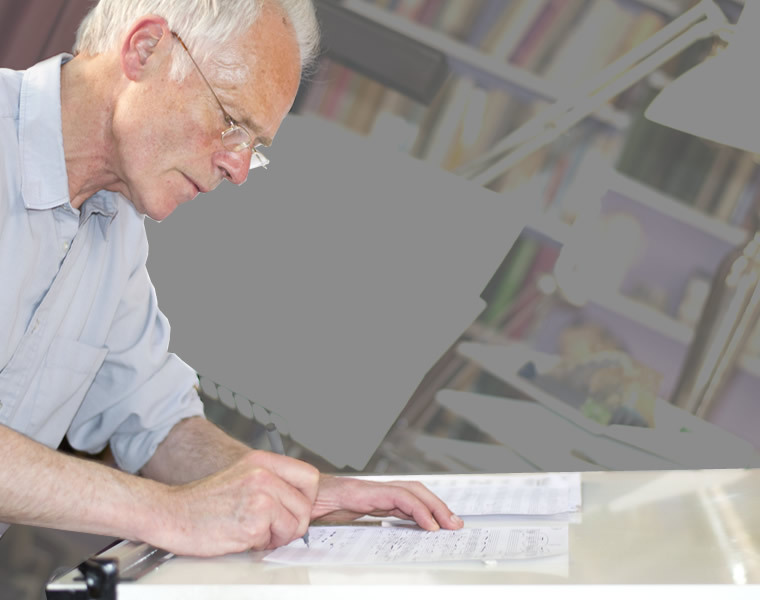 This is the definitive website for the work of Robin Holloway, composer, teacher and writer. The contents of the site are largely written and presented by Robin Holloway himself. CLICK HERE FOR A LIST OF HIS LATEST COMPOSITIONS (updated October 2018). a link to a YouTube video interview, featuring a broader perspective of Robin's work. 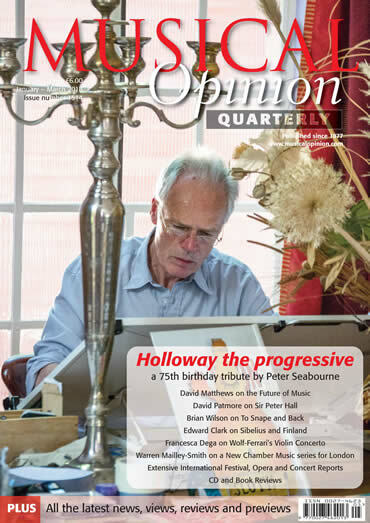 Robin Holloway's 75th birthday year began with the publication of a tribute by composer and past-pupil Peter Seabourne in Musical Opinion Quarterly. "As a callow young man, I recall vividly the first one-to-one encounter with my new composition teacher, Robin Holloway. He was standing under an old yew tree outside his Cambridge home, eating berries. "Try these!" he said, "it's only the pip that's poisonous - they taste like pink clouds!" Somehow both description and intent are appropriate to Robin's work and aesthetics: whilst dallying with the peril within, he has dared to savour the exotic fruit surrounding it ...and found it good." Click right for the Musical Opinion website. Click below for Peter Seabourne's website. Click the image on the left to buy the CD. 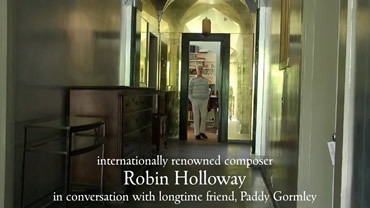 Click below left for an audio player, in which Robin Holloway discusses the works featured on the CD with his old friend Paddy Gormley. The interviews are adorned with illustrative fragments from the Rest Ensemble recordings. Click below right for a video interview on YouTube. "A 75th birthday tribute, lovingly done by all concerned." 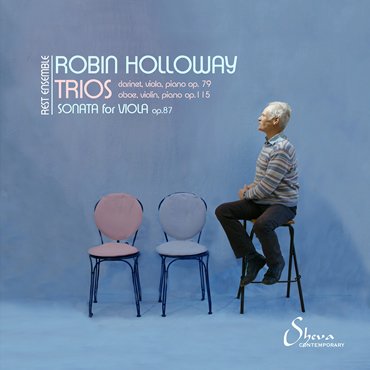 "Holloway paints an engaging picture with this pair of trios and a sonata; the storybook-like trio for clarinet, viola and piano is the charming highlight." "Both the Op 115 Trio and Sonata for solo viola, Op 87, adopt a formal structure where the final movement’s bipartite design telescopically conflates the mood and tempo of the previous two movements. This works especially well in the sonata, where the preceding trios’ animated chatter has given way to an internal musical dialogue at peace with itself. The performance by members of the Rest Ensemble is accurate and assured throughout." "Three charming, inventive and eloquent works by Robin Holloway in thoroughly sympathetic performances." "The performances on this disc are all uniformly excellent, with the performers clearly enjoying Holloway's idiomatic writing and striking ear for timbre and texture." "This is quick-witted music, nicely captured by the lively playing of the Rest Ensemble." "The Trio for Oboe, Violin and Piano is more traditional in outline, sparer in language, but engaging in its keenly argued craftsmanship." "Holloway doesn’t do bland neo-romantic pap: this is accessible, intelligent and entertaining music which shouldn't scare anyone. I'm smitten with the Trio for Oboe, Violin and Piano from 2012." [Of Viola Sonata op.87] "An introspective, brooding work, it's compellingly played by young violist Henrietta Hill." "The single movement Trio for clarinet, viola & piano, Op. 79 constantly ebbs and flows from tonal to atonal, basic to complex rhythms, old logic to new logic. But despite these schizophrenic or contradictory elements, it's Robin Holloway's fine weaving of the various motivic aspects of the work that forms a binding... thread. The Rest Ensemble present an engaged and convincing account of this challenging music."